At least, that’s our prediction. With Ducati’s V4 sportsbike arriving in showrooms, the bike has already captured the hearts and minds of many with its familiar Panigale lines and all-new frame and of course, state-of-the-art 211bhp powerplant. However to recuperate the substantial financial investment by Ducati it stands to reason that they will milk the new engine configuration for all its worth. Looking at sales of their Italian counterparts at Aprilia with the naked Tuono V4 clearly outselling the fully-faired RSV4, it’s not difficult to imagine what Ducati’s next use of the V4 will be. It’s our prediction that a naked V4 streetfighter will appear at some point in 2019 with leaked info and development images later this year. Expect a retuned version of the Stradale motor, delivering 10% less peak power (who wants to take a naked bike to 190mph anyway?) but with a stronger low and midrange for those fast traffic light getaways. 185-190bhp wouldn’t be too far from the ballpark and would leave the 170bhp Tuono, KTM Superduke and BMW S1000R covered in the Bologna factory’s exhaust fumes. Styling could take a cue from the previous Streetfighter with a Panigale V4 twist and the chassis would almost certainly be on display – Ducati will want to showcase both the new engine and the alloy frame and how the engine acts as a stressed member, and they’ll want to do it in the most brutal fashion possible, stripped to the bone, purposeful and compact without any excess plastic. It’s likely that there’d be a normal vanilla version and a specced-up S model with the usual Ohlins suspension, lighter wheels and carbon fibre extras. 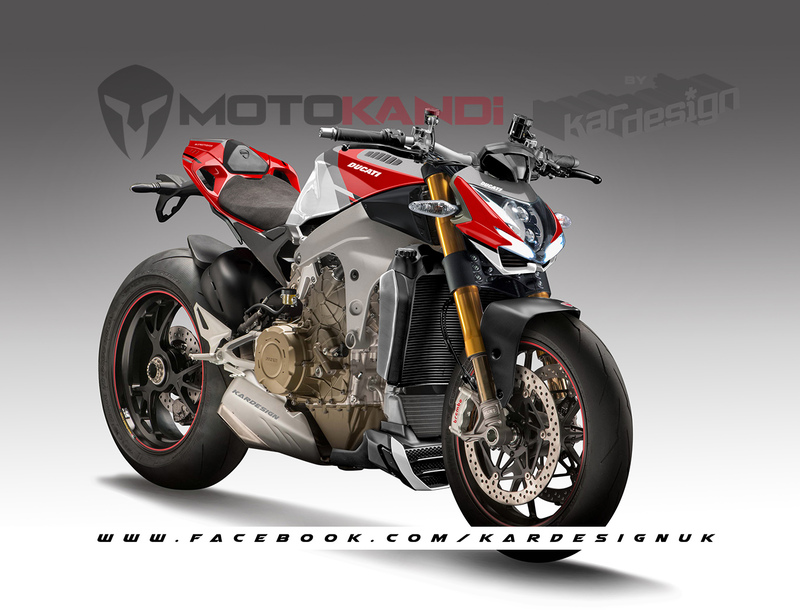 Check out the short video for more images and subscribe to MotoKandi – Kardesign’s official YouTube channel –if you want to see more.